Amenities: Business center, gym, media room, top floor BBQ area. Other: This building has two wings separated by a courtyard which is directly above the earthquake fault line. This building used to be "101 Market Street" apartments and was converted in 2005 to condos with sales of the units lasting into 2009. There is a coffee shop in the street level retail. West: No view west, looking into the Horizons high rise condos. North: Open view over the Ralph's grocery store until you get to the shopping mall a block over. East: Not much view, looking into the mid rise condos across the street. South: Right now this is the best view, but there is a parking lot directly behind Atria. This is scheduled to be a high rise condo one day. So dont buy it for the view that may one day be gone when you go to resell it. 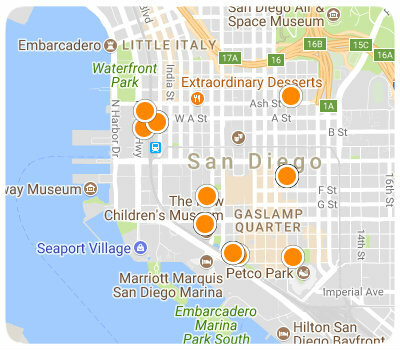 Like the most: Atria condo residents conveyed to me they like the very close proximity to the grocery store, Horton Plaza mall, Gaslamp Quarter and theaters. Some compliments were given to the loft floor plans (which are on the western half of the complex). Several owners said they like the common area outdoor deck. Atria condo residents also feel the building is very pet friendly. Like the least: Residents of the Atria condos wish the complex had a pool and guest parking. Other comments: Atria condo owners expressed they feel the monthly HOA fees are reasonable.